The ABC and CBS evening newscasts on Wednesday night carried full stories on the racially-tinged remarks by Democratic presidential candidate Joe Biden, but only NBC's David Gregory reminded viewers of how Biden "has made indelicate remarks before." In an interview with the New York Observer published Wednesday, Biden said of competing candidate Barack Obama: "You got the first mainstream African-American who is articulate and bright and clean and a nice-looking guy." In his piece, which led the January 31 NBC Nightly News, Gregory recalled: "Biden, who admits he has a tendency to bloviate, has made indelicate remarks before. Last year speaking about Indian-Americans:" Viewers saw video from C-SPAN, of Biden in a crowd, dated June 17, 2006: "You cannot go to a 7/11 or a Dunkin' Donuts unless you have a slight Indian accent." Gregory then noted: "Biden's first presidential run twenty years ago was undone after evidence emerged that he plagiarized a speech from a British politician, Neil Kinnock." Over on NBC's Today, co-host Matt Lauer warned of "a controversy in Washington over what literally could be the end of the world as we know it. Did the Bush administration freeze out scientists trying to sound the alarm on global warming?" ....Mr. Gore's preferred global-warming template -- namely, shrill alarmism. To believe it requires that one ignore the truly inconvenient facts. To take the issue of rising sea levels, these include: that the Arctic was as warm or warmer in 1940; that icebergs have been known since time immemorial; that the evidence so far suggests that the Greenland ice sheet is actually growing on average. A likely result of all this is increased pressure pushing ice off the coastal perimeter of that country, which is depicted so ominously in Mr. Gore's movie. In the absence of factual context, these images are perhaps dire or alarming. A general characteristic of Mr. Gore's approach is to assiduously ignore the fact that the earth and its climate are dynamic; they are always changing even without any external forcing. To treat all change as something to fear is bad enough; to do so in order to exploit that fear is much worse. Regardless, these items are clearly not issues over which debate is ended -- at least not in terms of the actual science. There is also little disagreement that levels of carbon dioxide in the atmosphere have risen from about 280 parts per million by volume in the 19th century to about 387 ppmv today. Finally, there has been no question whatever that carbon dioxide is an infrared absorber (i.e., a greenhouse gas -- albeit a minor one), and its increase should theoretically contribute to warming. Indeed, if all else were kept equal, the increase in carbon dioxide should have led to somewhat more warming than has been observed, assuming that the small observed increase was in fact due to increasing carbon dioxide rather than a natural fluctuation in the climate system. Although no cause for alarm rests on this issue, there has been an intense effort to claim that the theoretically expected contribution from additional carbon dioxide has actually been detected. Even more recently, the Climate Change Science Program, the Bush administration's coordinating agency for global-warming research, declared it had found "clear evidence of human influences on the climate system." This, for Mr. Easterbrook, meant: "Case closed." What exactly was this evidence? The models imply that greenhouse warming should impact atmospheric temperatures more than surface temperatures, and yet satellite data showed no warming in the atmosphere since 1979. The report showed that selective corrections to the atmospheric data could lead to some warming, thus reducing the conflict between observations and models descriptions of what greenhouse warming should look like. That, to me, means the case is still very much open. First, nonscientists generally do not want to bother with understanding the science. Claims of consensus relieve policy types, environmental advocates and politicians of any need to do so. Such claims also serve to intimidate the public and even scientists -- especially those outside the area of climate dynamics. Secondly, given that the question of human attribution largely cannot be resolved, its use in promoting visions of disaster constitutes nothing so much as a bait-and-switch scam. That is an inauspicious beginning to what Mr. Gore claims is not a political issue but a "moral" crusade. Lastly, there is a clear attempt to establish truth not by scientific methods but by perpetual repetition. An earlier attempt at this was accompanied by tragedy. Perhaps Marx was right. This time around we may have farce -- if we're lucky. # ABC's Good Morning America, January 31. 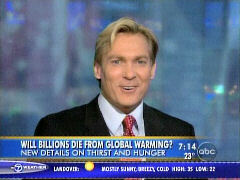 The MRC's Scott Whitlock took down the segment with this warning on screen: "Will Billions Die from Global Warming? New Details on Thirst and Hunger." Billions? Could that be a slight exaggeration? "This morning, we're hearing new information from those landmark, closed-door sessions on climate change. Five hundred of the world's top scientists meeting in Paris, joining forces to tackle global warming. The report is due out on Friday. Sam has been following the story. You know how passionate he is about global warming. Headline news everywhere. 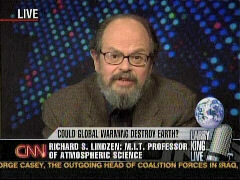 And I think one of the big headlines is that we could feel the effects of global warming sooner rather than later." Champion: "Yeah. That's what's in this report and why everyone is trying to jump this report that officially comes out Friday, Robin. There are big, new headlines and some of them are coming out of Australia in media reports. Now, they say that those scientists in Paris will estimate that between 1.1 and 3.2 billion people will suffer from water shortage problems by 2080. That's not your grandchildren, that's your children. And between 200 million and 600 million more people will be going hungry. That means a very real possibility of food and water shortages much faster than we thought and even in today's 'USA Today' paper they're talking about, uh, that the 2001 report said fossil fuel pollution by humans, used by humans, likely. This report will say 99 percent sure." Roberts: "How could the U.S. be impacted by what you just said?" Champion: "Well, there are places in the map that we've all looked at in studies that say these are the places you'll see drought and problems. And you're talking about South America and northern India, western China, north-central Africa. In the U.S., It's Colorado, Arizona and New Mexico, already suffering from low snow pack and could have water shortages by about 2080." Roberts: "Of course, global warming, hot topic on Capitol Hill this week and a number of hearings in the House, accusations of a White House cover-up?" Champion: "And they're saying some reports were edited by some White House staffers. And Rick Piltz's is the big one who, his report and his testimony brought it out. So let's listen to what he had to say." Congressman Stephen Lynch: "Did you ever get a plausible reason why he would remove that warning to Congress?" Rick Piltz: "He called it speculative musing." Champion: "And he's a former senior official in climate research in Washington and now has left that post, of course. Now, it is so serious to a lot of people, we'll be watching this report out, in Paris one of the neat things I think you'll see come out of this, is that they'll turn the Eiffel Tower lights out just to announce this report and kind of make that impact dramatic." # NBC's Today, January 31. The MRC's Geoffrey Dickens caught Matt Lauer's hyperbole in the 7am half hour: "Now to a controversy in Washington over what literally could be the end of the world as we know it. Did the Bush administration freeze out scientists trying to sound the alarm on global warming? Here's NBC's Andrea Mitchell." 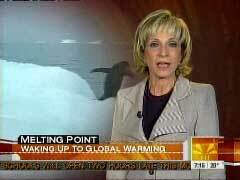 On Today, with "Melting Point, Waking Up to Global Warming" on screen, Mitchell began: "Mounting ice caps are having a dramatic impact in Antarctica." Mark Austin, ITN, with glaciers in background: "You can see some of these icebergs are melting. You can feel-"
Mitchell: "Changes recently witnessed by our British partner ITN are having an equally dramatic political impact in Washington." Sen. John McCain, at House hearing: "The argument about climate change is over. Now it's time to act." Sen. Hillary Clinton: "We are not making progress. In fact emissions are still going up." Sen. Barack Obama: "We've moved from the question, 'Is it real?' to the question, 'What can we do about it?'" Mitchell: "Now presidential hopefuls are demanding mandatory caps on fuel emissions and House Democrats are investigating charges that the Bush administration watered down scientific reports on climate change." Rick Piltz, former climate change official: "But it wasn't just policy it was spinning the scientific, the state of knowledge." Mitchell: "Documents uncovered by the Government Accountability Project, an advocacy group, reveal that critical findings were eliminated from draft reports. Questions like: 'Is abrupt climate change real?' And: 'What is the relationship between the drought in the West and climate variability and change?' Both crossed out with a hand-written note: 'It is not necessary here to list these examples.' So who was responsible? Scientists say Philip Cooney, a former oil lobbyist in charge of the Bush policy who has since left to work for ExxonMobil. He refused to comment." Dr. Francesca Grifo, Union of Concerned Scientists: "Our investigations found high quality science struggling to get out." Mitchell: "What has changed? The Democrats are now in charge of Congress and there's a growing consensus that fossil fuel emissions are melting the ice cap with the prospect of dire consequences for the planet. This week an international conference in Paris will report that global warming is manmade." Jerry Mahlman, National Center for Atmospheric Research: "The physics and the science of global warming have been nailed and understood well and we can see it playing out as to how Mother Nature is responding." Mitchell: "If nothing is done temperatures will climb by the end of the century, sea levels will rise, the snow cover will shrink." Carol Browner, former EPA administrator: "I do not think politics at this point will prevent real action. That's because the science has become so clear, so compelling in that large numbers of American people are saying, 'Why aren't we doing something?'" Mitchell: "The warnings about global warming can no longer be ignored even by politicians. For Today, Andrea Mitchell, NBC News, Washington." The ABC and CBS evening newscasts on Wednesday night carried full stories on the racially-tinged remarks by Democratic presidential candidate Joe Biden, but only NBC's David Gregory reminded viewers of how Biden "has made indelicate remarks before." In an interview with the New York Observer published Wednesday, Biden said of competing candidate Barack Obama: "You got the first mainstream African-American who is articulate and bright and clean and a nice-looking guy." In his piece, which led the January 31 NBC Nightly News, Gregory recalled: "Biden, who admits he has a tendency to bloviate, has made indelicate remarks before. 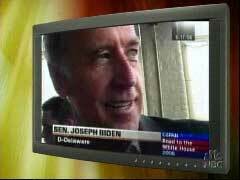 Last year speaking about Indian-Americans:" Viewers saw video from C-SPAN, of Biden in a crowd, dated June 17, 2006: "You cannot go to a 7/11 or a Dunkin' Donuts unless you have a slight Indian accent." Gregory then noted: "Biden's first presidential run twenty years ago was undone after evidence emerged that he plagiarized a speech from a British politician, Neil Kinnock." Over on ABC's World News, Jake Tapper uniquely played a soundbite from the right critical of Biden, an audio clip of Rush Limbaugh from his radio show: "See folks, this is the problem for the libs. Once they get off script they expose their idiocy, they expose their prejudice." Gloria Borger handled the CBS Evening News report.